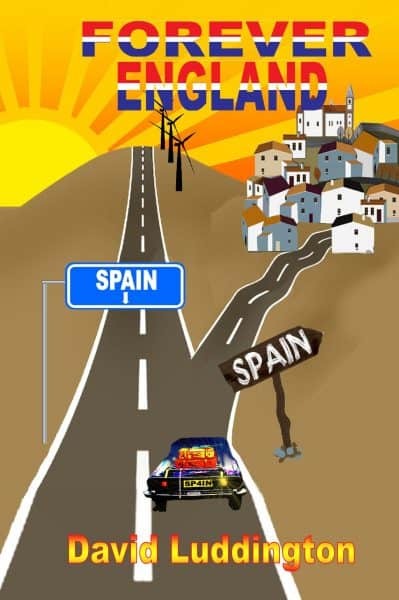 Forever England, one man’s quest to find the real Spain. He just didn’t expect it to be quite that real. Following an unfortunate encounter with Spanish gin measures and an enthusiastic estate agent, retired special effects engineer Terry England is the proud owner of a nearly completed villa in a new urbanisation in Southern Spain. Not quite how he’d intended to spend his enforced early retirement Terry nevertheless tries to make the best of his new life. If only the local council can work out which house he’s actually bought and the leaf blowers would please stop. Terry finds himself being sucked in to the English Expat community with their endless garden parties and quests for real bacon and Tetley’s Tea Bags. Of course, if it all gets too much he can always relax in the local English Bar with a nice pint of Guinness, a roast beef lunch and the Mail on Sunday. With a growing feeling that he might have moved to the ‘Wrong Spain’, Terry sets out to explore and finds himself tangled in the affairs of a small rustic village in the Alpujarras. It is here where he finds a different Spain. A Spain of loves and passions, a Spain of new hopes and a simpler way of life. A place where a moped is an acceptable means of family transport and a place where if you let your guard down for just a moment this land will never let you go again. Forever England is the tale of one man trying to redefine who he is and how he wants to live. It is a story of hope and humour with an array of eccentric characters and comic situations for which David Luddington is so well known and loved. “Genuinely funny, with many laugh out loud moment…” Matt Rothwell – author of Drunk In Charge Of A Foreign Language. Forever England is available in bookshops and online as Paperback, eBook or Audiobook. Kindle version currently discounted on Amazon or free under Kindle Unlimited.